In the advanced booking screen in package bookings, clicking on an appointment would cause the application to crash. This has now been resolved. A Release channel selector has been added to Main System Details for Administrators and Support. In Package Details, send document issue resolved. When a client books an appointment online, they are then required to pay the percentage of the bill at time of booking. 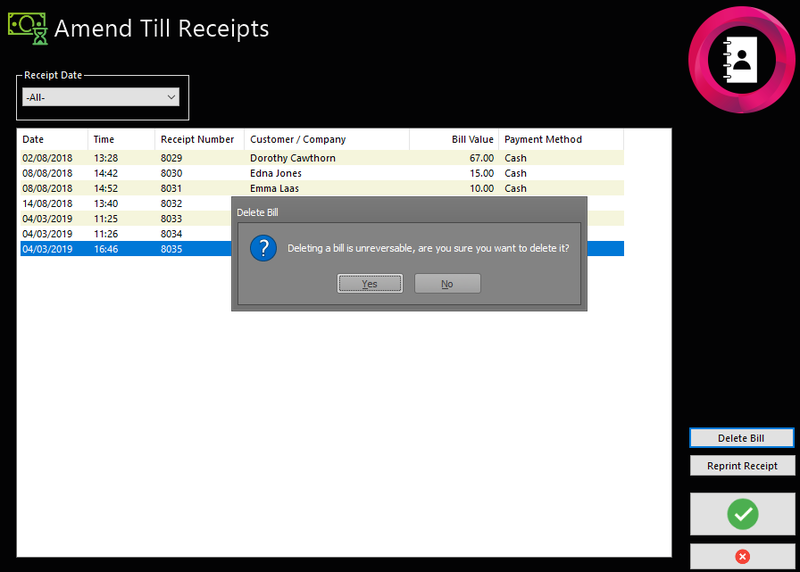 You can now delete bills from the Amend Till Receipts screen, you achieve this by clicking on Amend Receipts from the ribbon bar in Reception and then selecting the bill that you wish to remove and then clicking Delete bill. The ability to delete a bill in governed by a new security property which can be assigned through Administrator. Please understand that deleting a bill is unreversable. When booking an appointment for a room, the staff list was not loading. the staff list now loads depending on the appointment type that the user selects. We have made amendments to the way in which images are embedded in Emails so that they do not appear twice when viewing the email on Apple mobile devices. When adding Medical Questionnaires, they were overwriting the existing one, we have resolved this issue and now when saving it creates a new questionnaire result. When adding linked appointments and selecting a different member of staff, it was adding the appointment to the previous member of staff. This has now been updated to take into account the selected member of staff. When changing the member of staff on linked appointments, the time selected was being reset back to midnight, we have amended this to keep the same time that was selected before changing the staff member. When completing medical questionnaires from the consultation application, there were sporadic instances where the questionnaire was not showing the Reception application, this has now been rectified. Package bookings crashes have been addresses. Version 3.2.1 of Salon by Premier contains a number of improvements that will enhance your use of the software.